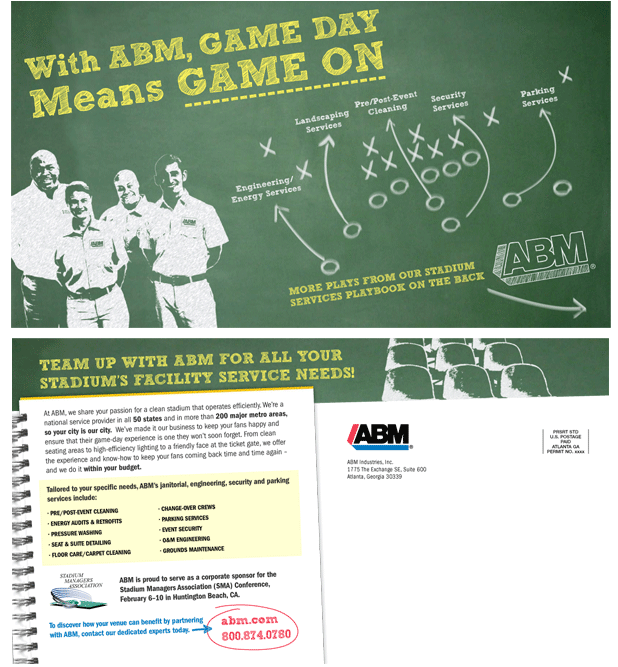 ABM Industries turns its attention to managers of sports venues with this direct mail piece. At ABM, we share your passion for a clean stadium that operates efficiently. We’re a national service provider in all 50 states and in more than 200 major metro areas, so your city is our city. We’ve made it our business to keep your fans happy and ensure that their game-day experience is one they won’t soon forget. From clean seating areas to high-efficiency lighting to a friendly face at the ticket gate, we offer the experience and know-how to keep your fans coming back time and time again—and we do it within your budget.